From life-like casinos to Parisian boulevards and automated gardens, props to Karl Lagerfeld for bringing to life sets that could only be a figment of one’s imagination. 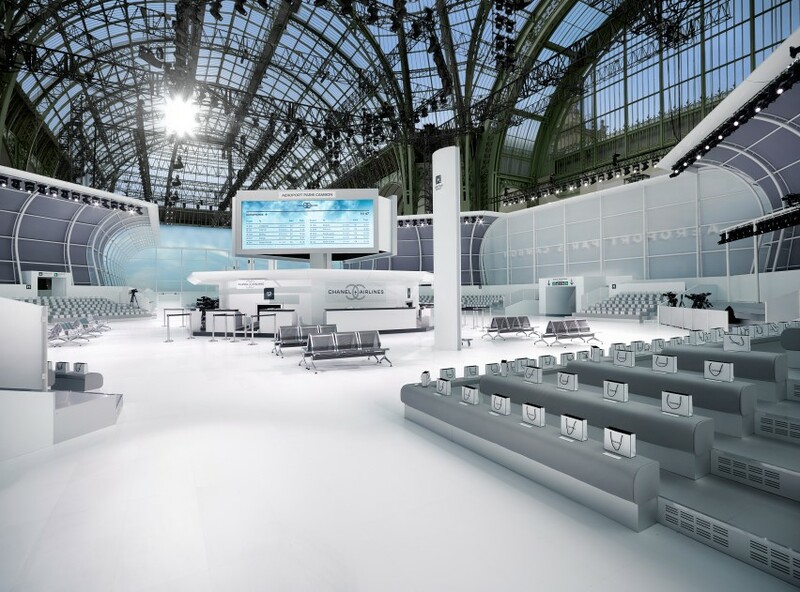 This time, the Grand Palais was transformed into an airport – Terminal 2C. The boarding happened at Gate no5, which as any Chanel aficionado would know, is the brand’s lucky charm. Contrary to what you would usually spot at a terminal – people hobnobbing around in sweats, sunglasses and trolleys – this airport schooled us on the chicest way of boarding a flight! Lagerfeld added humour to this mile-high fantasy by incorporating flight-based arrows and similar motifs on blouses, trousers and pleated skirts. Breaking the mould that vanity unequals comfort, the brand showcases their ready-to-wear line that boasts of practical-wear. The colour palette reflects the myriad blues of the sky and is plastered all over the tweed, denim, leather, lace and ottoman outfits. Move over flat-forms and airport sneakers, and say hello to wedge sandals and open booties in transparent plastic. The exciting addition to this collection is the Coco case, fondly called the ‘absolute bag’ by Lagerfeld. For the global traveller, this should definitely be your next duty-free splurge.